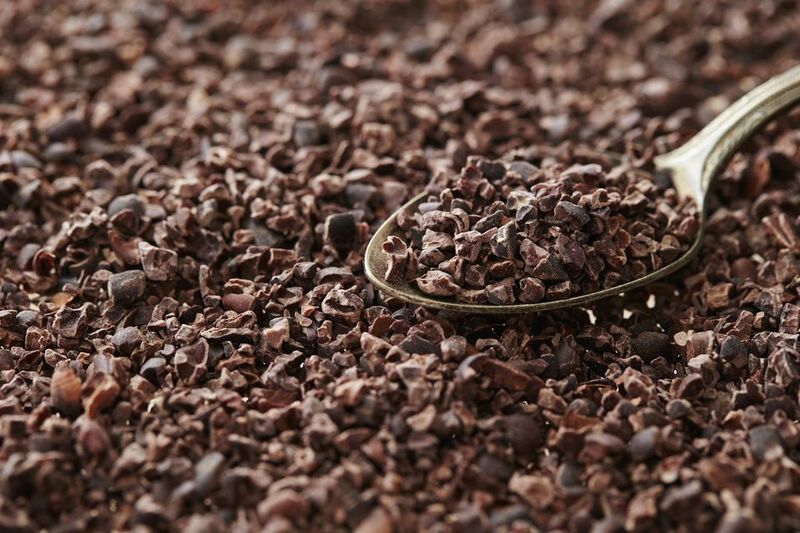 Cacao nibs are minimally processed pieces of the cacao bean. While being used in making chocolate for centuries, they have grown in popularity in the modern culinary sphere for other purposes. Cacao nibs are deliciously nutritious little morsels that not only add an intense chocolate flavor to foods but also a subtle crunch. Learn where they come from and how to use them in cooking. The word cacao and cocoa be thought of interchangeably. The cacao bean (actually a seed pod) comes from the Theobroma tree, which is also known as the cacao or cocoa tree. People have been enjoying the culinary benefits of the cacao tree from around 1400 to 1500 BC in Mesoamerica. Artifacts from ancient Aztecs reveal that a beverage made from cocoa beans had been consumed, but it was unsweetened and much different than the hot cocoa beverage we think of today. Cacao beans were also used as currency across Mesoamerica, prior to the Spanish conquest of the Aztec Empire. Today, cocoa beans are grown in tropical regions of the world that are in a narrow belt 10 degrees on either side of Equator. The main producers are in Brazil, Ecuador, Ghana, Nigeria, Cameroon, Cote D'Ivore, Malaysia, and Indonesia. Cacao nibs are simply a part of the cacao seed, or bean, that has been harvested, fermented, dried, cleaned, roasted, cracked, and then removed from the shell. This results in cacao nibs, which are ready to enjoy as is, or more often ground into a smooth paste which is known as chocolate liquor a very important ingredient in chocolate making. Cacao nibs have all the benefits of eating dark chocolate, without the added sugar. They are high in fiber, protein, and antioxidants, and contain the same mood-boosting chemicals and lipids that make a bar of dark chocolate so darn satisfying. You can purchase cacao nibs online, and they are also available from many natural foods and specialty shops as well as making their way into well-stocked grocery stores. Add some pizzazz to your morning oatmeal by adding a teaspoon or two of cocoa nibs for a fun texture and chocolate boost. Put a few tablespoons into a chocolate smoothie to make it even more chocolaty. Create an easy dessert by melting 1/2 cup dark chocolate chips along with 1/4 cup peanut butter. Mix in a tablespoon of cocoa nibs and spread it onto a silicone mat. Chill for 20 minutes in the freezer for a delicious treat. Stir them in a delicious tomato-based sauce and allow to simmer. Once cooked, blend them in a blender until smooth and use as a pasta or enchilada sauce.